Anchor today launched a major new version of its iPhone app, alongside a new web experience for creators. 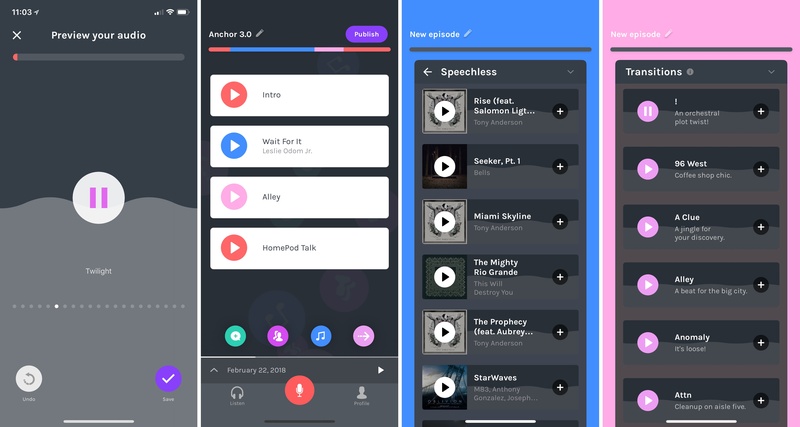 Anchor 3.0 is a ground-up redesign that takes lessons learned in past versions and applies them for the purpose of making podcasting as effortless and accessible as possible. My prior experience with Anchor has been limited, but every time I've given it a try, I came away impressed. The latest update to Anchor isn't so much about flashy new features, but more about demonstrating a new level of maturity: the interface is now cleaner and easier to navigate, the task of recording and publishing podcasts has never been simpler, and there are new built-in tools available to creators to help make recordings professional-grade. In preparing this story, I wanted to approach the app as a new user might, documenting the experience of getting set up and creating a new show. Anchor has always done fairly well at being user-friendly, but I think that's more true now than ever before. Anchor's new app has three primary navigation tabs: Listen, Record, and Profile. The former is for discovering new podcasts and playing ones you've saved as favorites. 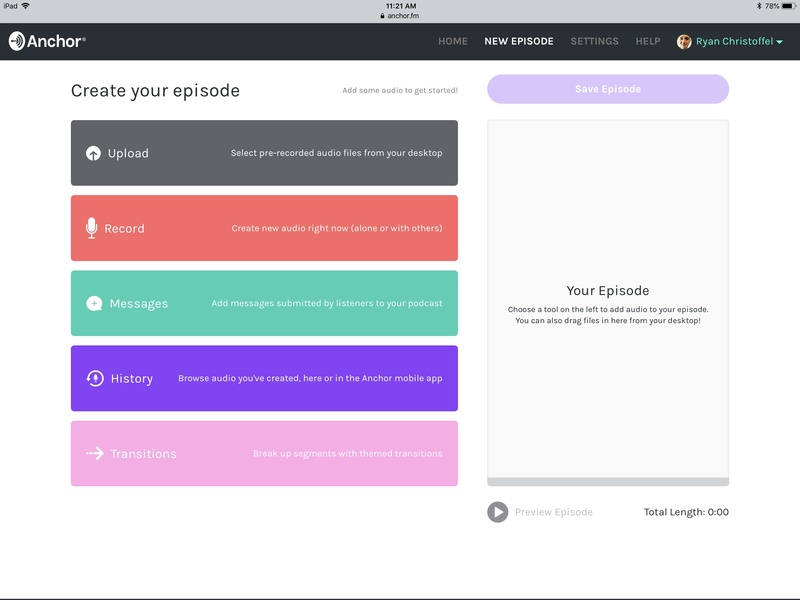 Profile is the hub for managing your own Anchor channel, including editing or publishing previously saved recordings, seeing how many users have favorited your show, and changing settings. In the Record screen, the act of recording itself is extremely simple. Hit the microphone, and you'll be instructed to either hold your phone to your ear to start recording, or you can hit the microphone button again to do the same. Recordings no longer have any sort of time limit, so you can get an hours-long show wrapped in one go. Another nice perk in Anchor's recording flow is the assortment of background music that can be added to your show with a single tap. Outside the main, solo recording option, Anchor provides four other main tools from the Record screen. You can browse voice messages from your followers, which can then easily be added to a show you record; users can send in voice messages by visiting a show's profile page. Another tool enables initiating a live recording with one or more friends, so you can record multi-person shows without needing to mess around with a separate app or service. A third tool uses your Apple Music or Spotify account to add songs to a recording. And finally, Anchor also includes a variety of transitions built in that can help add extra color and fun to your podcast. Thanks to Anchor's new episode builder, taking all this different content and organizing it to form an episode is easy. Theme colors for distinct content types make it easy to see at a glance what you're working with, and if you decide to reorder anything, you can do that using the edit function. There aren't any tools to make audio edits to your recordings, but the small set of options make the app way more accessible than wrangling files in an app like Logic. And if you really like Anchor's service and toolset, but want the type of refined control over audio quality that other apps provide, you can visit the new web interface for uploading existing audio files to your account. 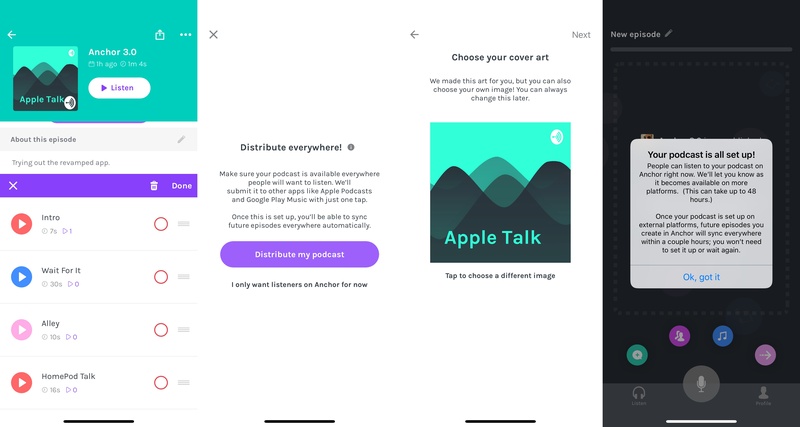 One of the features I appreciate most about Anchor is how the app takes care of publishing your work to services like Apple Podcasts, Google Play Music, and more (including a new partner: Spotify). The platform used to be too locked down, so publishing to other services was overly cumbersome, but now the complete opposite is true: there's virtually no work required to publish your podcasts elsewhere. I walked through the initial setup process to see how it worked, and there's nothing to it. You set the show name, upload cover art or use the stylish art auto-generated by Anchor, then you're done. Anchor takes care of all the work from there. Also launching today, alongside Anchor's new iPhone app, is the service's first true web app. You can create new recordings, upload existing recordings, browse voice messages from your audience, and more all from within your web browser. The web tools are presented in a clean, stylish format, and publishing from the web is just as easy as in the iPhone app. If you're an iPad user though, unfortunately, the web interface isn't entirely friendly to mobile Safari. You can still use parts of it, but ultimately it wasn't designed for touch input. The other new aspect of Anchor's web presence is featured pages for each Anchor show. These enable listening to a podcast's full catalog from your browser, and also have direct links for listening in your favorite podcast client. Here's the page for Relay FM's new show, Subnet. Relay launched Subnet in conjunction with Anchor 3.0's debut. It's a flash briefing show where host Stephen Hackett provides quick snippets on three relevant tech news stories each day. Because of its short, news-focused approach, Subnet is a great choice for listening to through a smart speaker, like an Amazon Echo, Google Home, or HomePod. 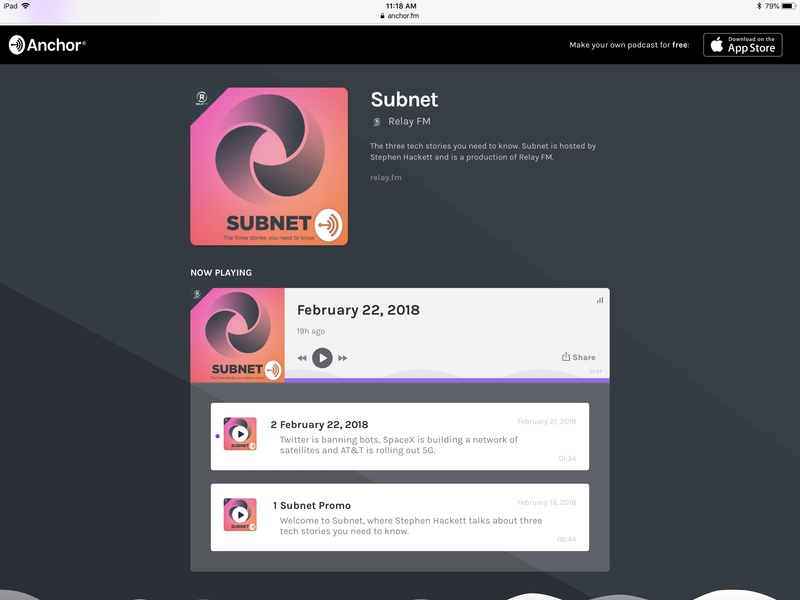 You can listen to Subnet using Anchor's Alexa skill, by asking Google Home for the news from Relay FM, or by asking HomePod to play the Subnet podcast. Anchor's integrations with digital assistants make it great for short news briefings like this one. I've always been intrigued by the goal Anchor's team has pursued – democratizing audio by making it easy to create and share. The app has been home to lots of good ideas in the past, and Anchor 3.0 is in many ways a summation of those past successes. 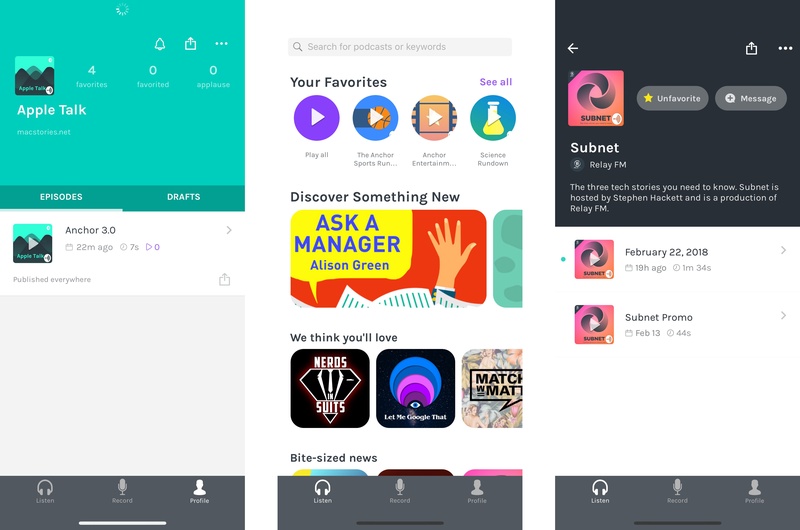 With the launch of a significant web presence in the form of creator tools and dedicated pages for Anchor shows, alongside a refined iPhone app that makes creating podcasts easier than ever, it feels like Anchor is taking a major step forward. Time will tell if users agree, but I'm excited to see what the company's doing. Anchor for iPhone is available on the App Store.